Last week, I joined 24 young people and 12 teachers in Doncaster for the Send My Friend to School 2018 Campaign Champions training weekend, alongside 3 other members of staff from the Send My Friend coalition. This year, the Send My Friend to School campaign, which RESULTS is a part of, is calling on the UK government to make schools safe by signing the Safe Schools Declaration. The inspirational Campaign Champions had travelled from as far afield as Dorset and Gateshead for a busy weekend of training. Over the weekend, they heard about many of the different issues related to Sustainable Development Goal 4 (to ensure inclusive and quality education for all and promote lifelong learning) and how to use their voice to ensure that every child receives an education. The Campaign Champions saw inspiring videos of other youth campaigners, such as Malala Yousafzai and Fahma Mohamed, as well as learning about the complex issue of school safety and all it encompasses, including conflict, bullying, dangerous infrastructure, disease and natural disasters. In order to plan for the rest of the campaign, the Champions were trained in using the media, public speaking and engaging with MPs. After speaking on how we can use the media to amplify the message of the Make Schools Safe campaign, the Campaign Champions planned their own local media activities, such as writing for the school paper, organising a public exhibition and speaking on a local radio show – so watch this space! They also learned about many of the different, imaginative ways to campaign and prepared their own photo stunts in small groups. The highlight for me was seeing the photo stunts come together, and hearing the Campaign Champions test out their influencing skills in MP role-play scenarios. “We are 24 young people from across the UK who have come together to campaign on global education because we share a common passion to ensure that all children across the world enjoy a safe, quality, inclusive education. We strongly believe that every child deserves the same opportunities regardless of their background or identity. We need to #MakeSchoolsSafe because no child should be denied right to education. Yet every year 246 million children experience some form of school violence. This is outrageous and has to stop! How are we expected to be the next generation of doctors, lawyers or world leaders when we are unable to receive a quality education? Today we are releasing this joint statement to call on the UK Government to sign the Safe Schools Declaration and encourage other countries to do the same. 73 countries are already signed-up, 13 in the commonwealth, why aren’t we? The Campaign Champions will be putting all their new influencing skills into action over the next few months by running assemblies, visiting local primary schools, contacting their MPs and coming together in Parliament for a day of action, where they’ll have the opportunity to speak with their MPs about the campaign. 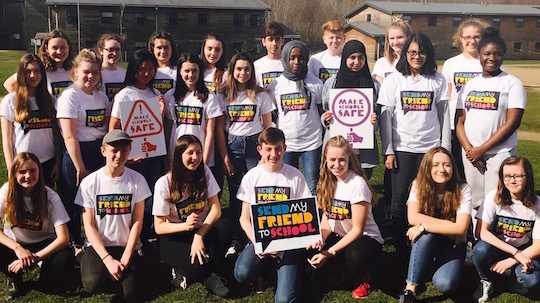 You can follow all the activities of the 2018 Campaign Champions by keeping an eye on the @sendmyfriend Twitter account, and you can also help them to spread the word by sharing their joint statement and shouting about the #MakeSchoolsSafe campaign!